Leeds United boss Neil Redfearn was left frustrated after his side suffered their fifth straight loss in a tale of two penalties. Another bad week for the club ended with a 2-1 defeat at Charlton Athletic, which saw the Whites drop down to 16th place in the Sky Bet Championship. In the circumstances following the sudden and not convincingly explained withdrawal of six players 24 hours before the game it was a decent display from United and they would have brought a point back with them if Billy Sharp’s first half penalty had not been touched onto the post by home keeper Stephen Henderson. But after leading at half-time through Steve Morison’s first goal in a year they were disappointed not to be able to hold on after the break when Charlton upped their game. Two goals in five minutes from Tony Watt and Yoni Buyen, who was successful with a spot-kick turned the game on its head. “It’s frustrating. I thought we played really well in the first half,” said Redfearn. “We talked about it at half-time, the need to start the second half well. I didn’t think we started it badly, but we just didn’t start with the same momentum. “We let them get back into it. “It’s disappointing because we missed a penalty and could’ve been 2-0 up. It would’ve been a different picture for them. “To be fair to these lads, they’ve given everything for us and I can’t go criticising them. “There are a lot of things that have happened, but they’ve got the club in a safe position. “It’s not ideal, the run that we’re on, but things that have happened have taken their toll. “The support was fantastic again for the players. Without Marco Silvestri, Mirco Antenucci, Giuseppe Bellusci, Souleymane Doukara, Edgar Cani and Dario del Fabro who all mysteriously declared themselves injured on Friday, Redfearn was forced to make changes to his team with a league debut for the club for Stuart Taylor in goal and recalls for Rudy Austin in midfield and Morison up front in a switch to a 4-4-2 formation. Austin fired a half-chance wide in the first minute and Luke Murphy shot over after being well placed in the box after Alex Mowatt’s cross was flicked on by Morison. Morison came close to getting the ball from a back pass, but Henderson’s clearance bounced to safety off the United striker. Murphy’s shot from outside the box was saved by Henderson before Sharp headed over from a Sam Byram cross. Igor Vetokele hit the post as Charlton finally threatened and the woodwork came to United’s rescue again soon after as Tal Ben Haim’s shot was deflected. 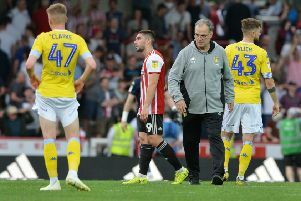 Leeds missed a glorious chance to go ahead, however, when Byram was brought down by Yoni Buyens, but Sharp’s penalty was touched onto the post by keeper Henderson. They did go ahead, however, soon after when Morison ended his long goal drought with a volley from Murphy’s corner that proved too powerful for Henderson. Charlton made a change at half-time and it proved inspired as sub Johann Gudmundsson proved a key figure as the game was turned around. It was Gudmundsson who set up Charlton’s equaliser with a far post cross that found Watt unmarked to make it 1-1. Leeds did have some attacks of their own with Mowatt shooting over and Austin having an effort saved, but it was 2-1 on 79 minutes when Stuart Taylor saved from Gudmundsson’s shot from the edge of the box, but as the ball went loose from his parry he was adjudged to have tripped Vetokele. Up stepped Buyens to send the keeper the wrong way and more points were slipping from Leeds’ grasp. United looked to respond, but could not get an equaliser as Austin’s long range shot was kept out and Liam Cooper headed wide. Charlton Athletic: Henderson, Solly, Fox, Gomez, Ben Haim, Eagles (Gudmundsson 45), Buyens, Diarra (Cousins 11), Bulot, Vetokele (Church 90), Watt. Leeds: S Taylor, Wootton, Bamba, Cooper, C Taylor, Byram (Dawson 88), Murphy, Austin, Mowatt, Sharp (Montenegro 84), Morison.